Managing Director calls on the Hon’ble President of The People’s Republic of Bangladesh. Browse: Home > Managing Director calls on the Hon’ble President of The People’s Republic of Bangladesh. The People’s Republic of Bangladesh. Managing Director of PKSF and President of Bangladesh Scouts Mr. Md. 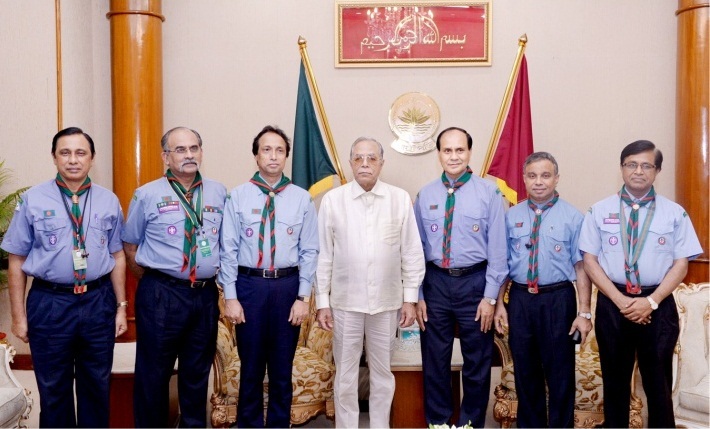 Abdul Karim led a team of Bangladesh Scouts to Bangabhaban on 2nd July, 2014 and met the Honorable President of Bangladesh His Excellency Mr. Md. Abdul Hamid. The team included the Vice President of Bangladesh Scouts Dr. Sadique (Secretary, Ministry of Education), Habibul Alam Bir Protik, Chief National Commissioner Abul Kalam Azad (Senior Secretary in Prime Minister’s Office) and International Commissioner Dr. Mozammel Haque Khan (Senior Secretary, Ministry of Home Affairs). The delegation briefed The Hon’ble President about various activities of Bangladesh Scouts and invited him to open the next Scout Council on 14th July, 2014. He accepted the invitation and wished the scouts movement all success.